The building with the cupola is Billy McConnell's store. Billy and his wife Martha lived above the store. When we found this painting in a book on American Regionalists, Mom (Doris Irene Elliott Garlock) thought the tavern must be the building to the left, which she remembered having a pool hall. Charles Burchfield was a well-known twentieth-century American Regionalist painter. He was born in Ashtubula Harbor, Ohio in 1893. His family lived in Salem, Ohio in his early years. Working in watercolors, he painted the things he saw around him everyday--the views out of his windows, his street and neighbors, his town and its environs. Burchfield felt he had to spend time in a place and with its people in order to be able to paint them. For a few years after moving to Buffalo, New York, where he lived and worked as a wallpaper designer, he returned to his home state to find familiar subjects for his paintings. 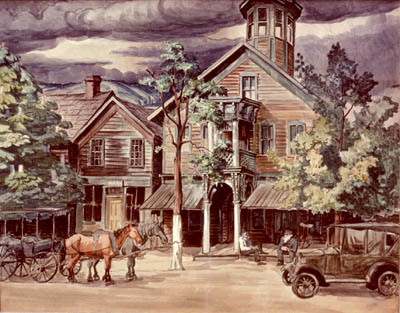 In 1928 he visited Hammondsville, Ohio in Jefferson County, adjacent to his home county of Columbiana and painted "The Tavern in Hammondsville, Ohio." He captured the town in its prime when it prospered with brickyards, clay mines, stone quarries, and coal mines. During the early 1920s Burchfield received recognition for his work capturing small town midwest America. Major museums such as the Brooklyn Museum in New York City and the Metropolitan Museum of Art began to acquire his work in 1924. In the 1930s he had exhibitions at museums like the Museum of Modern Art in New York City. Burchfield died in 1967 at the age of 74. He preserved the essence of small town midwestern American life through his work. Many of his subjects are still standing in the Salem, Ohio area and the Burchfield Homestead Society is working to preserve them. Many thanks to the Addison Gallery of American Art at Phillips Academy Andover for permission to use this painting from their collection. "When Pop [Emery Garlock] came to the "crick" [about 1921] he and some of the guys used to hang out in that little building [in the painting of "Tavern in Hammondsville, Ohio"]. At that time it was a pool hall run by Sammy Parsons. The guys would swipe the soda pop and Sammy got really mad about it. One day he laced some bottles with Croton Oil and when the guys swiped it they all got the skids. That cured them of taking Sammys soda pop." "Dad [Howard Elliott] and his brother, Charlie, had a butcher shop in that building for awhile." 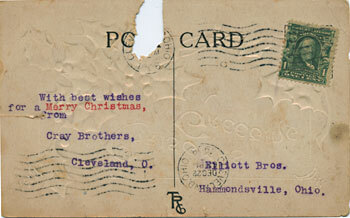 Check #347 from Elliott Bros. dated Sep. 19 1903 drawn on the Silver Banking Co. of Wellsville, Ohio made out to George A. Frick for three hundred dollars. 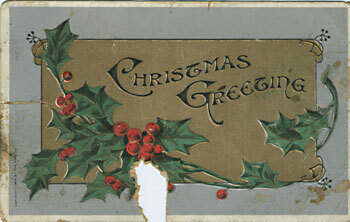 Christmas card to Elliott Bros. from Cray Bros. of Cleveland, OH dated 1908 [presumably Cray Bros. was a supplier for the shop]. "I remember very well the experience I had in that old building [the one with the tower] and if someone were to tell me this I would never believe it but  The large building was the home and general store of Marthy and Billy McConnell. Billy was known for being able to remove warts. My left hand was well covered on the back with small seed wartsat one time well over 100. When I was 8 or 10 years old Dad took me to see him. We went up a dark windy stairway to his (Billys) den. The merchandise was just scattered around and lots of cob websBilly took my hand in hisrubbed over the back with a potato cut in half and a week or so later the warts were gone His wife, Marthy, founded the 1st Christian Church there so we had three churchesMethodistCatholicand Christian." "My granddaughter, Carla, showed me a picture she found in a literature book while she was teaching school and I recognized it as I used to be around that vicinity when I was small. Your Mom, [Doris Elliott] and I used to go in that part of Hammondsville when I took piano lessons. I believe she took them too. But this tavern and a house beside it that Billy McConnell & wife Martha used to live in.... I believe the tavern is the one that your Mom and I would kid about having a bake shop in there. We both liked to bake." Letter from Dorothy Call Scott of Coatesville, IN, dated 12Sep1999. Dorothy Call [age 92] was born and raised in Hammondsville, OH. She and Doris Elliott Garlock were best friends during their childhood. They lived just across the road from each other at the bottom of Somerset Hill, Hammondsville, Ohio. "My grandmother knew Martha McConnell very well as Martha was very active at the Christian Church, along the railroad tracks toward Cream City . ["The Tavern of Hammondsville " was a tavern that she believes was run by Sam Parsons and it would be the one on the left [in the painting]. Peggy Young Steele reported that the wife of Jay Tolson [raised in Irondale, Ohio] sent her a picture of the "Tavern in Hammondsville, Ohio" painting by Charles Burchfield . It had appeared in the April, 1999 issue of the American Medical Journal. The Tolsons currently reside in California.